The first major change of the Chris Heck era has been unleashed on the RBNY fan base, and like the team's results as of late, it's not going over well. The first change is that for the first time since the opening in 2010, Red Bull Arena is restructuring the seating tiers. 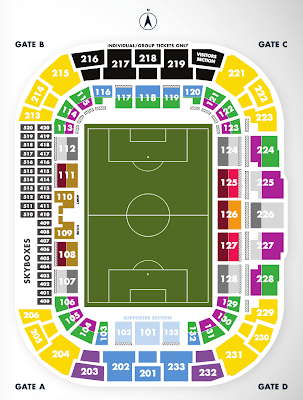 While Club Seats and Premium Midfield still go by those names, the remainder of the stadium is divided into "zones". Nearly every lower bowl section is zoned differently between the front and the back, and the central sections in the upper deck are similarly split. Overall, lower bowl ticket prices have either remained flat (supporter's section, club seats, and the back halves of the corners) or gone up. But upper bowl tickets have generally dropped or are no longer available, with the strange exception of the tickets over the South Ward which have gone up slightly. This does finally end the weird state of the upper bowl tickets costing the same as the lower bowl tickets. Biggest losers in the price increase are the holders of Premium Midfield seats in 108 and 111 which were rezoned to Club Seats, thus forcing a $2000 per seat increase should they be hellbent on keeping those seats. (Full disclosure: I am one of these people.) People with front seats in 125-127 are also being rezoned up to Premium Midfield, a hike of $380 per seat. Biggest winners are the back sections of 225 and 227, (should there be any season ticket holders there at all), who are seeing a 33% drop in cost from last year. As Matt Conroy has pointed out, the Supporter's Sections being flat on cost (and a lack of information in the renewal booklet) means that there will likely be an increase in tourists for next season. Gold brings you a $10 credit on your card, a 5% discount on all merchandise at the Bull Shop, and a $30-ish welcome gift. A Gold card costs $25 per seat. Platinum brings you presale access to other events at RBA, a chance to win a pre-season trip, a waiting list for seat upgrades, and "exclusive access to a team related event". It also ups the benefits from the Gold level to $25 credit and 15% discounts, and includes the welcome gift. Platinum cards are available for free if you renew on a payment plan and make at least one payment by September 30th. Unlike last year, where the STH renewal window started in October and ran towards December before new STHs were accepted, this year's window for renewing your existing seat ends on September 30th. This means that to get full benefits (Black card required) and to be able to keep your seats, you have barely over two weeks to find a method to pay for your seats in full. Let us know your experiences and thoughts on renewals -- especially after a season like this -- in the comments. And perhaps we'll be back later to talk about the Vancouver game.